Imagine a versatile life, one filled with adventure, travel and of helping others. Sounds like a dream come true, right? Well, that’s pretty much the life of reconditioned steel drums. From the beginning to the end of a reconditioned steel drums life span, it could cross the globe, hold everything from wine to paint to fuel and oils. With each new use, the steel drum adds value to someone’s life and industry, picking up slight dents, a new scar and the tell tale signs of a life well lived. Steel drums begin life new and shiny as they roll off the manufacturing line. Made from top quality cold rolled steel, these drums can range in size from eight gallons to 46 gallons. 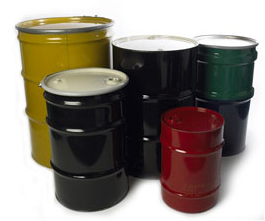 Depending on their initial intended use, steel drums also receive various interior coatings. These coatings can make a steel drum food grade and ready to transport food and beverages. Other coatings protect the drum from corrosive liquids and contents like adhesives, sealants or paint that could erode the steel. Finally, each drum gets a lid that fits the needs of its intended owner. And then the drum is off! The adventure begins as the drum travels to its intended destination, ready to serve a purpose. When a steel drum can no longer serve its original purpose or its original owner no longer needs it, then a steel drum enters the next phase of its life — reconditioning. Reconditioned steel drums still have a lot of life left in them and have much to offer a new industry. The drum makes its way to a reconditioning facility, one certified to restore drums back to a usable state. The reconditioning process has several steps, sort of like a facelift or spa retreat for steel drums. First, the reconditioning facility washes the exteriors of the drum. Then, the facility drains all remaining residue of the previous ladings — or contents — of the drum and purges the interior. Next, the facility washes, dries and individually inspects the interior of each drum. Drums with excessive corrosion receive an acid treatment. Chimes, the bands used to reinforce the tops and bottoms of drums, get retightened. The drum receives clean fittings and new gaskets. The facility applies a new exterior finish. And finally, the newly reconditioned drum gets shipped off to it’s new home. During the reconditioning process, a steel drum may find itself repurposed for an entirely different use than it had originally. For example, covered barrels can become open barrels. A barrel that once held pie filling may now hold mining materials. But like all well-lived lives, the life of a steel drum will eventually come to an end as well. A steel drum can only go through the reconditioning process so many times before it is no longer suitable for reconditioning. At this stage, the steel drum can still serve a purpose, becoming reincarnated into the final stage of its life — recycled steel. Recycled steel has several purposes. It can get turned into new vehicles, become part of a bridge or get turned into stainless steel. The possibilities are endless. Reconditioned steel drums live good lives of invaluable purpose. And, through reconditioning and recycling, they have the chance to live on, gaining new purpose and vitality along the way — definitely a life well lived.